In the last week I’ve been requesting quotes from local machine shops to manufacture the arbor for a wet grinder I’m constructing. I have been quite astonished by the variation in estimates. Then I remembered that a website called eMachineShop.com was featured in Wired Magazine some years ago and now seemed like the perfect time to give them a try. The software download setup was free, super fast and I was hoping that I could import an .iges or .step file from Inventor but this feature seems to be still in beta and all I got was a handfull of error messages even though the part is relatively simple. Fortunately the learning curve is virtually non-existent for a longtime user of VectorWorks, Adobe Illustrator, and Autodesk Inventor so after I skimmed one tutorial and I had gleaned enough to replicate my original part in about 20 minutes. In another 10 minutes I had a of list quote options to choose from. Sadly, for this “one-off” part the lowest quote was outrageously high compared to some I’ve gotten locally and worst of all, the lead time was listed at nearly two months! Suffice to say, eMachineShop will not get my business this time but I think I’ll be going back to their software. I feel like I can learn a lot about manufacturing nomenclature and common practice by putting together a few more hypothetical estimates. Also, they offer many other processes besides traditional machining and I’ll surely give them a try in the future when I have need of something I can’t figure out how to make myself. But that seems to happen less and less frequently these days. 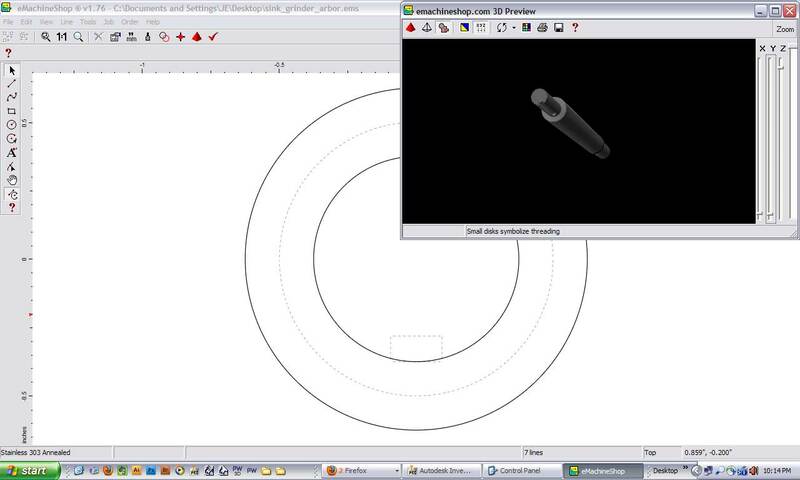 This entry was posted in making and tagged autodesk, emachineshop, fabrication, inventor, lathe, review, sink grinder. Bookmark the permalink. I know you’re a pretty busy guy, but why aren’t you just machining this yourself? looks like you would need a lathe, a mill and an indexer, or something to hold your turned piece while you mill it. I know stainless is awful to turn, but your piece looks beefy enough that you might not get alot of chatter (you know cause i know what the hell i’m talking about). All too true. But I’m getting better about staying focused on what my real goals are and if this was the only bid I could find, you know I’d be figuring it out. Even then I’d likely have to make two. One to fail with and one to succeed with. Luckily I found a machine shop in town who would do it for $75 and a 24 hour turn around. I’ll be picking it up on Monday. Hopefully it’s not a piece of crap. Ok…you have a lot of gold nuggets on your blog…I am loving it! Excellent blog entries!!! I didn’t have a good time with them. As a newbie, I couldn’t enter my relatively simple part in to the software even though I’ve used Visio some. They said no problem and created the software diagram for me which I checked for sizes and approved. Then I couldn’t find the payment until they told me where it was in the tab menu (it doesn’t come up like a regular shopping cart). But the real problem came when they delivered the parts. They were off on the dimensions. I asked them about it and they said I had ‘checked’ the 20% margin in a check box menu somewhere so my parts are 20% off. Of course they must default to that error or they checked it in the software diagram because I couldn’t even find the ‘pay’ check box. So I paid for useless parts that are too costly to remachine. I’m starting all over again with my local shop. About Gottland’s comments above on pricing, it’s difficult to compare a quote which includes the material, precision cutting on a CNC machine and shipping, to a customer-supplied material quote on a manual machine with local pickup. Additionally, our prices and delivery time have come down significantly. As for Bruce’s experience, it is unfortunate, however we go to great lengths to try and avoid these types of errors by providing a pre-order checklist and providing an interface where our customers can communicate their desired tolerances. We encourage anyone in need of custom parts to review the information on our site and ask any questions they might have. The job status page is useless. It would be nice to know if it’s awaiting materials, in process, etc. Just got my parts today, and I’m very unhappy with them. 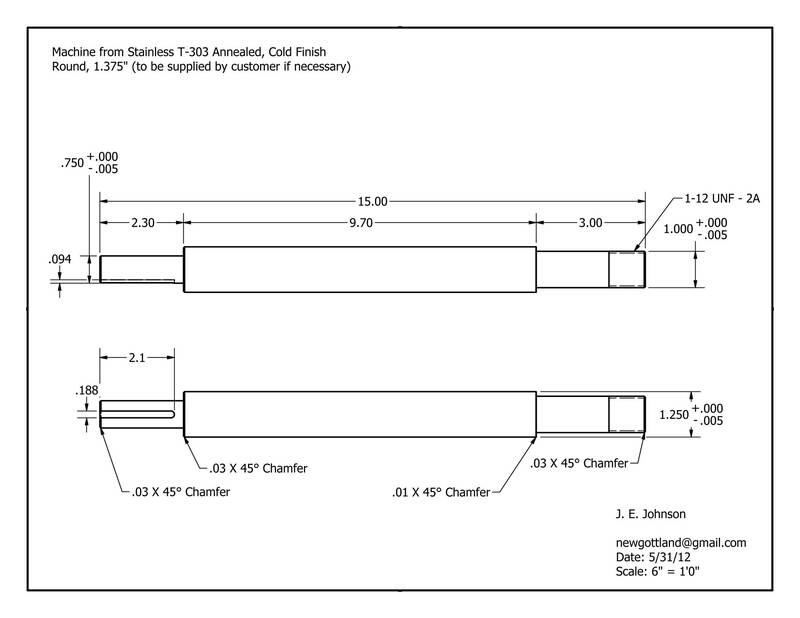 I sent a proper drawing with both RFQs and they built it to the first drawing, not the rev B drawing. My take is that they can’t do drawings and rely on their software.